The Battle of Manila was the only urban battle waged by the American Armed Forces in the Pacific during World War II. In the evening of February 3, 1945, American motorized units, with the aid of Filipino guerillas, stormed the gates of the University of Santo Tomas (UST) to liberate American and other civilian allies interned there from around the start of the Japanese occupation of Manila on January 2, 1942. The first American air raid over Manila on September 21, 1944, was the prologue to the forthcoming battle that would bring about the destruction of the city that we all then fondly and proudly called the Pearl of the Orient. Since 1936, my family had lived in Ermita in a house located in the corner of Isaac Peral (now U. N. Avenue) and Florida (now M. Orosa) Streets. My father, George Litton, Sr., had bought this house from the Spanish Moreta family. It was a beautiful three storey Moorish styled edifice with arches, balconies, and a roof garden. The Florida Street side of the house faced the Episcopalian Cathedral of St. Mary and St. John on whose site now stands the Manila Pavilion Hotel. Ermita was a quaint, distinct, and idyllic residential area. It had a character of its own, different from that of Malate, Paco, or Pasay. 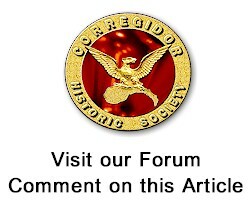 It was, in the words of Carmen Guerrero Nakpil, “[A] charming colonial town built by Europeans and Americans….” Many Spanish families lived in Ermita as did other expatriates. It was common to read a doctor’s shingle hanging outside his office describing the medical practitioner in Spanish as a “Medico-Cirujano” and signs of “Cuidado por los Perros” hung on the gates of houses so as to warn passers-by that the house was guarded by fierce dogs. Isaac Peral Street was by far the most beautiful street in Manila. Both sides of the street were bordered by wide clean sidewalks and giant Acacia trees whose arching branches formed a tunnel like bower extending from Taft Avenue up to Dewey Boulevard (now Roxas Boulevard). I had turned eleven in June of 1944. We were then in the middle of the third year of the Japanese occupation and I was no longer attending school. I did return to La Salle as soon as it had re-opened in 1942, after briefly attending classes at St. Paul in Herran Street (now Pedro Gil). I had to leave La Salle after I had finished the third grade because transportation was getting very difficult. No cars were running as gasoline was not available. I would go to La Salle to attend my classes by taking the tranvia [streetcar] from San Marcelino Street but even that had become very difficult as the tranvias had become always jam-packed. Passengers would hang by the windows or even climb up the roof of the tranvias just to get a ride. My mother transferred me to Santa Teresa in San Marcelino Street, a girl’s school run by Belgian nuns that accepted boys up to the fifth grade. Santa Teresa was just a fifteen minute walk from our house. 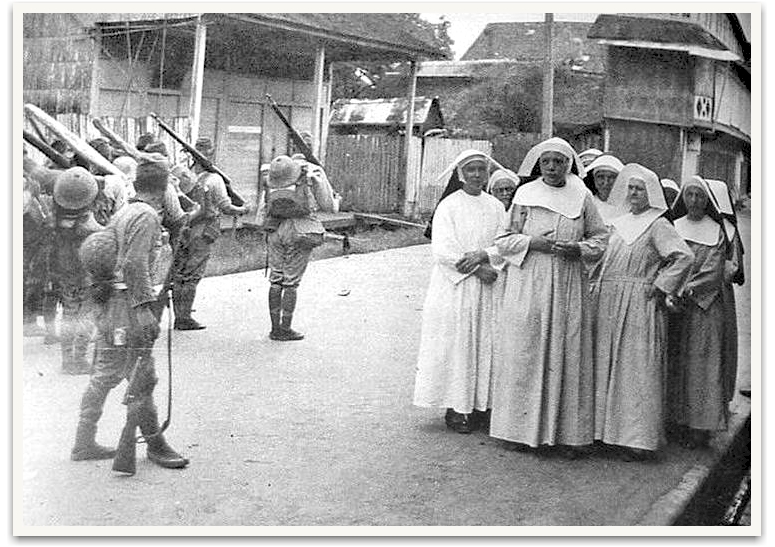 In May or June of 1944, however, the Japanese military took over the premises of Santa Teresa and thus I no longer had a school to go to. In the early morning of September 21, 1944, I went to Wallace Field to meet my close friend Henry Chu. Wallace Field was the site of the famous annual Manila Carnival. It is now part of the eastern section of Rizal Park. Henry Chu lived in San Luis Street (now T, M. Kalaw) at the Queens Hotel (a precursor to our present motels), which was owned and managed by his father. Our carefree morning was suddenly interrupted by what, at first, we thought were airplanes in practice maneuvers. We suddenly realized that there was something terribly wrong when one plane burst into flames and tracer bullets began to lace the clear Manila sky. I stood in awe, seemingly unmindful of the danger, as I fixed my gaze upon a single engine plane descending very fast, almost at an angle of 90 degrees, and releasing its bombs at a Japanese ship docked at the South Harbor. My friend Henry grabbed my arm and pulled me as we both ran to his father’s hotel and into an improvised air raid shelter dug at the ground floor. There were many more air raids after the first one in September 21. As soon as we would hear the air raid siren announcing an imminent attack, my brothers and I would rush to our roof garden to get a ring side-view of the drama unfolding before our eyes. The air raids became more frequent around the end of October. By then, we had almost daily air raids by American dive bombers and later by a new American fighter-bomber, which we later learned to be the P-38. This fighter-bomber had two engines, one on each of its two separate fuselages, both of which were connected to each other in the middle by the cockpit The skies, during and after an air raid, would be darkened by the mushroom-like puffs of exploding anti-aircraft shells aimed at the raiding airplanes. These shells would rain the ground with deadly shrapnel, which we kids would collect and keep. Around this time, there occurred two tragic incidents that I still clearly remember. What Frank Stagner did not see was that one of the crew that had bailed out had fallen and drifted towards Ermita and the bay. From our roof garden perch, we could clearly see this hapless American dangling from his chute as it descended and drifted towards Dewey Boulevard. When the chute was nearly overhead and the man strapped to it was clearly visible, we suddenly heard a series of gunshots. The Japanese were shooting this completely helpless man dangling on a parachute! The barbarity of this incident was shocking even to an eleven year old boy! Many years later, after the war had ended, I would learn the fate of the crew of this unfortunate B-24 from Sascha Jean Jansen, nee Weinzheimer, an American friend, interned in the UST, and daughter of the former owner of the Canlubang Sugar Estate. 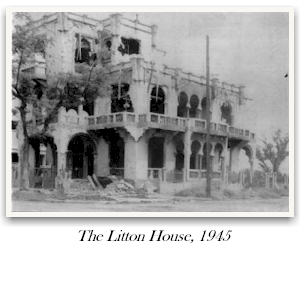 James T. Litton and his family lived in pre-war Manila and suffered through the Battle of Manila. 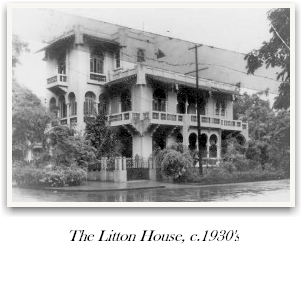 In 1936 his father, George Litton, Sr. bought a home situated on Isaac Peral Street, right across from the Episcopal Cathedral. Jim has worked tirelessly for the erection of monuments to the memory of the WWII heroes. He is a lawyer and a hardworking member of the “Battling Bastards of Bataan”.